Modern tourism market is characterized by a large number of trends caused by frequent changes in the requirements of tourism demand. By adapting the tourism offer to the current trends on the tourism market, a destination can become more competitive. Since the tourist destination offer should be integrated, it is crucial to point out the importance of observing the changes in the environment at the level of a tourist destination. Driven by numerous stakeholders, the management of the tourist destination uses different strategies to make the tourist offer attractive and modern. 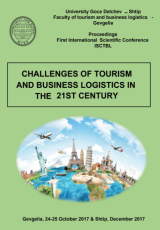 The aim of this paper is to analyze management at the level of tourist destinations and to present possible marketing and strategic options for adapting the tourist destinations offer to modern market trends. The process of adapting and responding to changes and trends in the environment requires careful proactive action of the tourist destination key stakeholders. MILIĆEVIĆ, Snežana; ĐORĐEVIĆ, Nataša. THE PROCESS OF ADAPTATION OF TOURIST DESTINATION OFFER TO THE CONTEMPORARY MARKET TENDENCIES. Yearbook - Faculty of Tourism and Business Logistics, [S.l. ], v. 3, n. 2, p. 212-218, feb. 2018. Available at: <http://js.ugd.edu.mk/index.php/YFNTS/article/view/2204>. Date accessed: 22 apr. 2019.